Fortune strikes again! 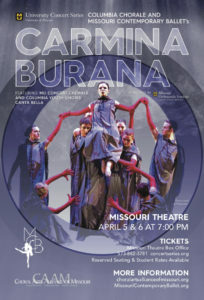 After an incredibly successful two-night run in 2015, Missouri Contemporary Ballet and Choral Arts Alliance of Missouri team up again to produce Carl Orff’s timeless work in the way he envisioned: “total theatre,” combining music, words, and movement to produce a thrilling effect. Get your Columbia tickets now through the Missouri Theatre box office or the University Concert Series before they’re sold out! Various musical genres and forms are brought head to head in this exciting concert of contrasts. Don’t miss CYC’s final concert of the season as they explore everything from classic music to rock, musicals to opera, and everything in between, with special guest ensembles including a rock band and professional classical string quartet. 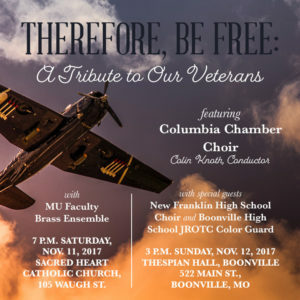 Columbia Chamber Choir will premiere new choral works commissioned for the ensemble at the Columbia Civic Orchestra’s annual new music concert, which features the winners of the Missouri Composers Orchestra Project and other new works supported by the Sinquefield Charitable Foundation. Join CAAM’s professional Artists-in-Residence Prometheus as they honor the life of fellow artist Nathan Ward, who passed in late 2018. 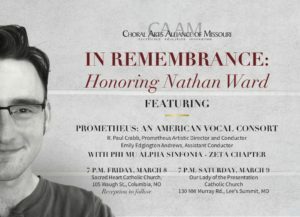 Friends of Nathan are warmly invited to join a “Remembrance Choir” to perform on this program in Columbia and/or Lee’s Summit. Register for the choir HERE. We hope you’ll join us in celebrating Nathan’s musical gifts, community impact, and life. A portion of concert proceeds will go to the Nathan Ward Memorial Scholarship and the planting and dedication of a tree on the MU Campus in his honor. 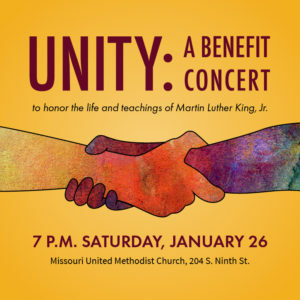 Missouri United Methodist Church, 204 S. 9th St.
Get energized for a new year of singing together – join us at the Unity Reunion for a morning of singing, socializing, and sustenance! 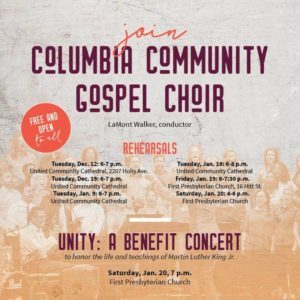 Columbia Community Gospel Choir and Columbia Chorale come together for a singing reunion on Saturday, August 11. Returning singers and those interested in joining should attend the informal gathering and short rehearsal from 10-11:15 a.m. (non-singing family members can swim at the beach or play in the park). Potluck lunch begins at 11:30 a.m. and is open to family members and guests. At 12:30 p.m. all are welcome to attend a free short concert in the park, open to the public. Directions and more information to come! Mark your calendars for this fun time together! 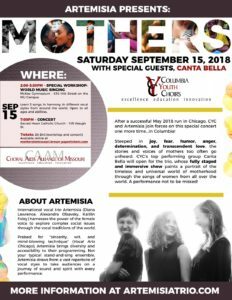 After a successful May 2018 tour to Chicago performing with the professional women’s trio Artemisia, the combined forces will present their concert one more time…in Columbia! Steeped in joy, fear, humor, anger, determination, and transcendent love, the stories and voices of mothers too often go unheard. CYC’s top performing group Canta Bella will open for the trio, whose fully staged and immersive show paints a portrait of the timeless and universal world of motherhood through the songs of women from all over the world. A performance not to be missed. CAAM and MU partner to host the fourth-annual men’s choral workshop for area singers ages 10 and up, this time in the fall! Dynamic and knowledgeable conductors will help singers dissect common vocal issues in a positive and supportive environment, culminating in a performance featuring workshop participants. Singers will sing in a mass choir, as well as a selected special interest track focusing on a specific music style (a cappella/pop, vocal jazz, barbershop, or standard classical choral literature). Lunch and music are included with the low registration fee. Join us in celebrating the beauty and power of the male voice. No preparation is needed. See what’s in store for the season as CYC presents its annual “Just a Taste Concert” for family, friends, and local seniors! This free-will donation concert raises money to help offset CYC music purchases for the year. 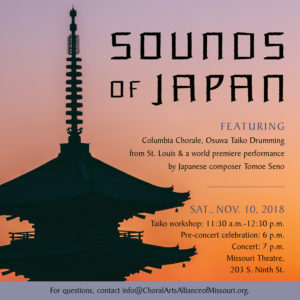 Columbia Chorale officially opens its 40th season with Sounds of Japan, a Japanese-themed concert featuring special guests the Osuwa Taiko Drumming Ensemble. The taiko’s deep, thunderous sound was traditionally used to communicate among neighboring villages and to intimidate enemies in warfare, but is now a celebrated art form worldwide. This concert uniquely blends Eastern and Western music and rhythm to depict a universal musical language that transcends borders and cultures. Dust off your old choral score and warm up your singing voice – CAAM is bringing back Handel’s Messiah in a special sing-along concert! 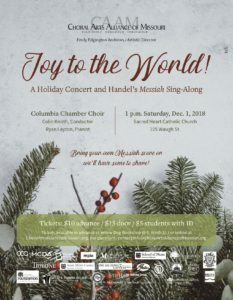 Join Columbia Chamber Choir as they perform seasonal favorites and lesser holiday known works, followed by an audience sing-along of many beloved Messiah choruses. 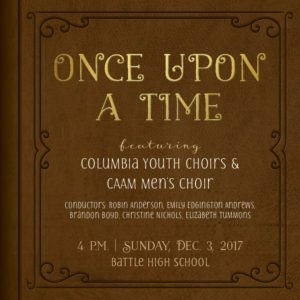 Join all members of Columbia Youth Choirs as they begin their 6th season focusing on the hopes and dreams of our young people whose voices, insights, and visions are too often overlooked or disregarded. With music, art, and poetry, they share their sometimes serious, sometimes silly but always sincere outlook on life as only a child can do. 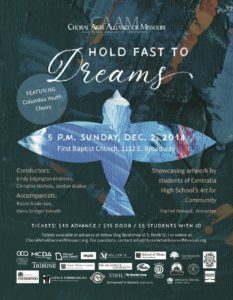 Hold Fast to Dreams features each of the CYC ensembles with special guest artists. On August 21, a total solar eclipse will appear directly over Columbia for the first time in over 140 years. With an estimated 400,000 visitors traveling to this ideal viewing area, CAAM eagerly joins in the festivities by presenting a multimedia concert of space-inspired music that creatively juxtaposes science with the arts. 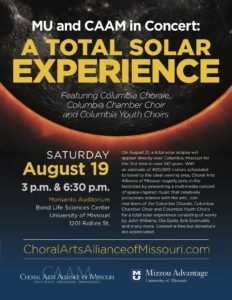 Join members of the Columbia Chorale, Columbia Chamber Choir, and Columbia Youth Choirs for a total solar experience with works by John Williams, Ola Gjeilo, Ēriks Ešenvalds, and many more. This concert is generously sponsored by Mizzou Advantage. Maurice Duruflé’s beloved Requiem, op. 9 (1947) masterfully combines Gregorian chant settings of the Latin Mass for the Dead with more modern harmonies of his French contemporaries. Joining Columbia Chorale is Prometheus: An American Vocal Consort, CAAM’s permanent professional artists-in-residence. 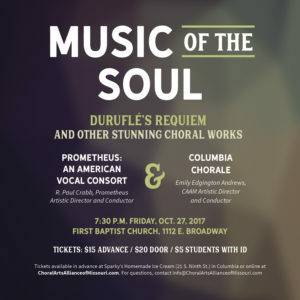 Columbia Chorale and Prometheus will present a rich program of lush music and inspiring texts to celebrate the ability of choral music to delve into the depths of human emotion, consolation, and healing. Prometheus in Concert celebrates the exceptional beauty and verve of a cappella music from Palestrina, Lassus, and Victoria, to sublime arrangements of stunning and rarely-heard American, Swedish, and Finnish folk music. Prometheus’ ten singers hail from across the United States. Each of them leading professional lives as soloists and chamber musicians, their experience bringing a special breadth and depth to the ensemble, lending Prometheus a unique versatility and intimacy. 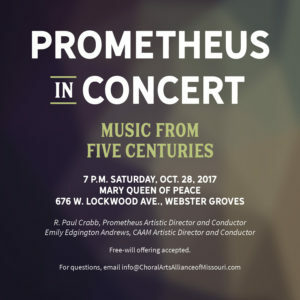 According to St. Louis critics, Prometheus, under the direction of Artistic Director and Conductor Dr. R. Paul Crabb, “represents some of the finest choral chamber singing you’ll hear anywhere in the Midwest.” In addition to performing live in concert Prometheus will lead several educational workshops and master classes during their regional tour in October. See what’s in store for the season as CYC presents its annual “Just a Taste Concert” for family, friends and local seniors! This free-will donation concert raises money to help offset CYC music purchases for the year. Join the Columbia Chamber Choir as we honor our country’s brave military service members. Thanks to their sacrifices, we are grateful and privileged to enjoy lifelong freedoms. Though the effects of war can be lasting and devastating, we hope to provide the audience, especially members of the U.S. Armed Forces (active and retired), a sense of true peace with poignant reflections on war, patriotism, life, and freedom. Take a trip to a fantastical land filled with talking beasts and true love, valiant quests and villains, heroes and happily ever afters! CYC concludes its first half of the season with Once Upon a Time, a dynamic concert that evokes wonder, imagination and enchantment through songs inspired by familiar and lesser-known fairy tales. Featuring artwork from the multi-award-winning Centralia High School Art Department through CAAM’s Partnership in Education and narration by a professional actor, this potent combination of music, art, and storytelling will keep audience members on the edge of their seats! Members of Columbia Chorale team up with the Missouri Symphony Society to perform selections during the Missouri Symphony Orchestra’s annual holiday concert. 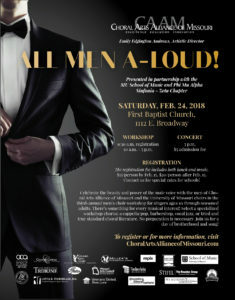 CAAM and MU partner to host the third-annual men’s choral workshop for area singers ages 10 and up. Dynamic and knowledgeable conductors will help singers dissect common vocal issues in a positive and supportive environment, culminating in a performance featuring workshop participants. Singers will sing in a mass choir, as well as a selected special interest track focusing on a specific music style (a cappella/pop, vocal jazz, gospel, barbershop, and standard classical choral literature). Lunch and music are included with the low registration fee. Join us in celebrating the beauty and power of the male voice. No preparation is needed. Don’t miss our pre-concert celebration with live music, dancing, and artwork from local artists from 6-7 p.m. in the Missouri Theatre Lobby, and concert at 7 p.m. 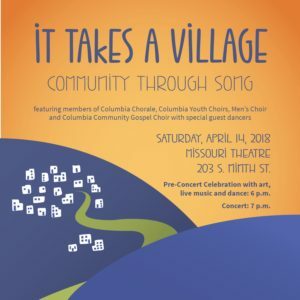 The seven CYC choirs, CAAM Men’s Choir, Columbia Chorale and members of the Columbia Community Gospel Choir will join forces to present a concert of epic proportions at the historic Missouri Theatre. This concert will feature English composer Alexander L’Estrange’s flagship work Zimbe!, a fusion of African song and jazz for mixed choir, semi-chorus, children’s chorus, jazz quintet, and percussion. African dance and visual artwork by local artists complement the powerful concert celebrating the value of a supportive community. This is a concert not to be missed! Tickets only: $15 general admission in advance$5 students with ID$20 general admission at the door Help us make this concert a true community experience open to all! We are working with old and new partner organizations (e.g., Granny’s House, Youth Empowerment Zone, and churches that support recent refugees) to provide free tickets to local residents who may not be able to afford to attend. Please consider sponsoring an advance general admission ticket at $15 or tickets for a family of four at $40. Thank you for your support! For its final concert of the season, Columbia Chorale pairs with Missouri Symphony Orchestra to present a masterwork from the canon of great choral-orchestral works.